One of the great advantages of Dublin as a place to live is its proximity to the Dublin-Wicklow Mountains. Many's the weekend I spent in my youth walking in these beautiful hills! One of the disadvantages that struck me about Paris when I moved there over 20 years ago was the relative lack of hilly terrain anywhere within easy reach. Walking in the countryside is just not the same when it's mostly flat. Madrid, at an altitude of 667 metres, is the highest capital city in Europe – if you don't count Andorra – and is just south of the Sierra de Guadarrama. 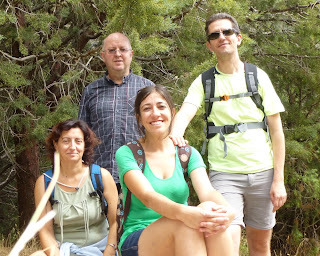 The excellent suburban train service of Madrid will take you in around an hour to the foothills of this wild and beautiful mountain range; direct trains from the city go to Cercedilla and Manzanares el Real, for example, from where you can take your choice of multiple trails into the hills and forests of pine and oak. On Sunday morning I went with some friends to Manzanares (910 metres) and from there spent a very pleasant few hours walking up along the banks of the youthful stage of the Río Manzanares. which in its mature lower stage flows along the western edge of the city of Madrid. The pace was leisurely enough. We started with a beer while we decided which route to take. Luckily it wasn't too hot, with a light breeze and intermittent cloud cover to protect us from the worst of the mid-afternoon sun. Near our highest point there was a convenient café-bar where we lunched on eggs and fries. And beer. Got home at 9.30 pm to wash clothes and prepare for the trip to Andalusia, which starts on Monday with a train ride to Cordoba.